Chocolate Pecan Fat Bombs – the perfect easy snack full of healthy fats and protein! Best of all, this recipe is made with only a few ingredients and is gluten-free, paleo, keto, low carb and vegan. Are you guys wondering what a fat bomb is? Up until I started on Keto, I had never heard of a “fat bomb”. A fat bomb is essentially a no bake treat made with a variety of fats. Depending on what diet or lifestyle you are following, you can pretty much customize them with whatever you like or have in your pantry. 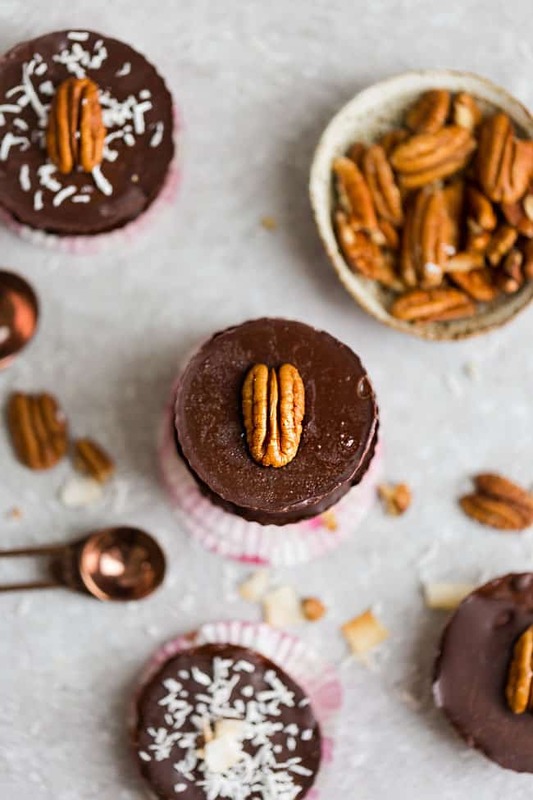 These Chocolate Pecan Fat Bombs are melt in your mouth delicious with tons of healthy fats. 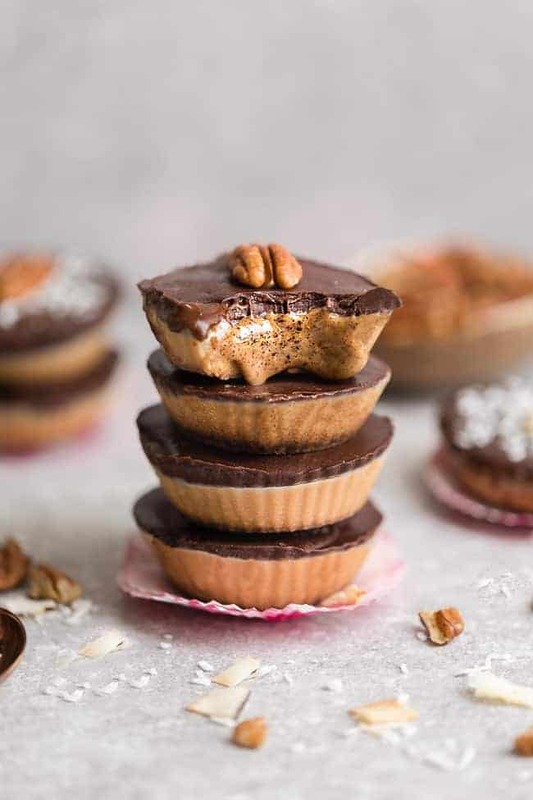 They look like those decadent Reese’s Chocolate Peanut Butter Cups minus any refined sugar. 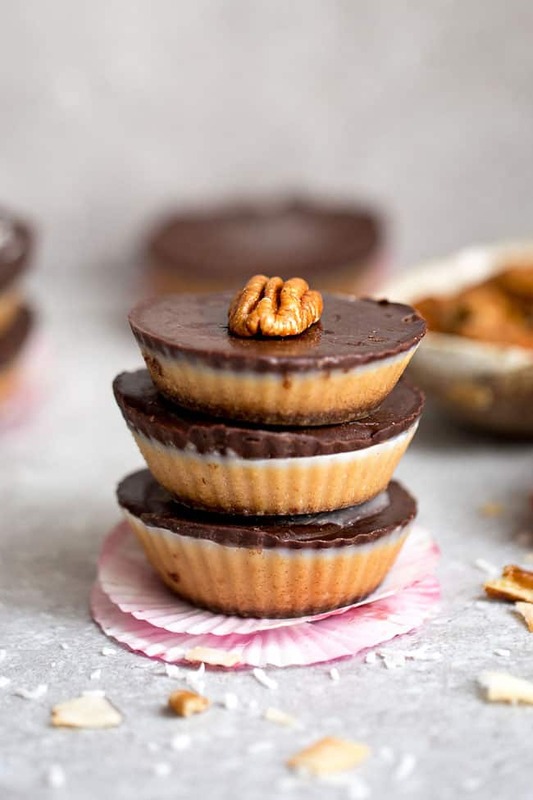 Making your own homemade Chocolate Nut Butter Cups means you can still have a decadent tasting but healthier treat if you’re trying to limit your sugar intake or are on a no sugar diet. 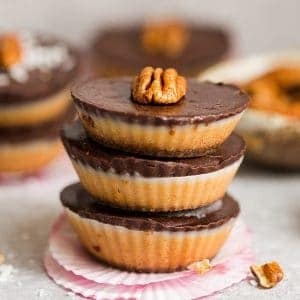 WHAT INGREDIENTS DO I NEED TO MAKE FAT BOMBS? To keep them vegan, paleo, low carb or keto, you’re going to use coconut oil, coconut butter, cacao butter, almond butter, cashew butter, pecan butter or sunflower seed butter. Other non vegan / paleo variations include cream cheese, butter, sweetener of your choice and chocolate or freeze-dried fruit. And if you’re not counting macros or would rather not use a low carb sweetener like stevia, monk fruit or erythritol, you can leave them out or swap in maple syrup or honey. You start off by melting the coconut butter together with the pecan butter in the microwave or in a saucepan. Keep in mind, you can also use almond butter, cashew butter, or your favorite nut butter instead. Stir in the sweetener (if using). Line a muffin tin with silicone or paper liners then divide the butter mixture evenly into each cup. Drop pan on counter a few times to smooth out mixture. Place the pan in freezer until layer is firm. Meanwhile, melt the chocolate. Remove the muffin tin from the freezer and spoon in melted chocolate over the butter mixture. Drop pan on counter to flatten layer. Freeze pan until cups harden. Serve chilled for a firmer texture. Serve at room temperature for a softer, creamier texture. 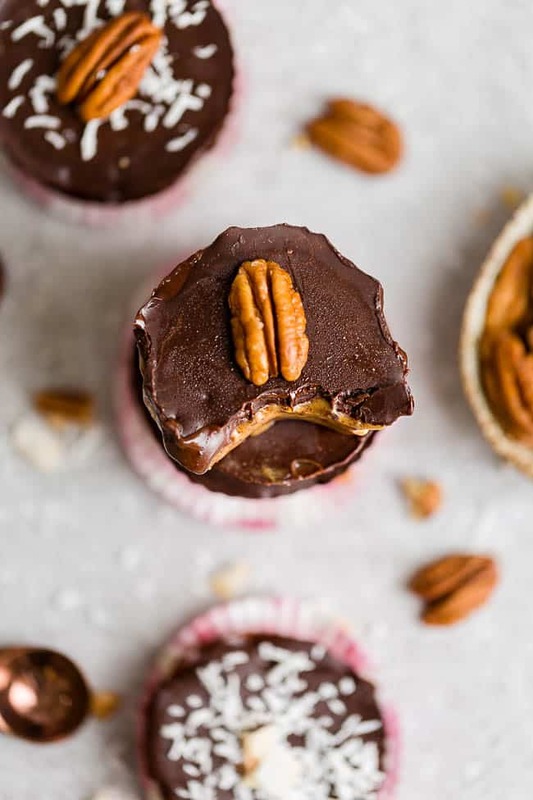 These Chocolate Pecan Fat Bombs would be amazing for days when you’re struggling to get enough fat to meet those macros. Also on the weekend when you need a sweet pick me up after an extremely rough week. Enjoy them straight from the freezer or fridge let them sit out at room temperature for a few minutes until they’re perfectly set, creamy, and smooth. Chocolate Pecan Fat Bombs - the perfect easy snack full of healthy fats and protein! Best of all, this recipe is made with only 4 ingredients and is gluten-free, paleo, keto, low carb, Whole30-friendly, and vegan. Line a 12 cup muffin tin with parchment paper liners or silicone liners. Heat pecan butter, coconut butter & coconut oil over a double boiler (or microwave) and stir until smooth. Remove from heat & stir in MCT oil, sweetener (if using) and salt until smooth. Adjust sweetener according to taste. These are seriously so Good! Thank you!